- This beautiful KWPN who’s six (just turning 7 with the new year 2019) is already proving to have the potential to be a fantastic FEI Dressage horse by Uphill X Kennedy. - He’s working on tempi changes and starting to really develop collection. 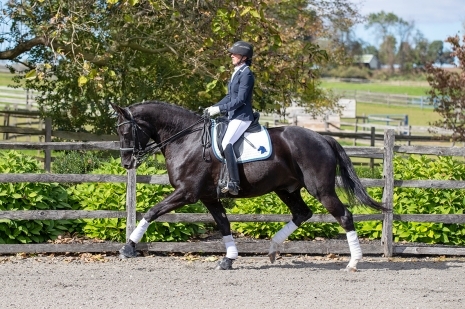 - He has three correct, naturally balanced gaits which are expressive and fluid. - An excellent hind leg to offer ultra collection and his conformation enables him to find all of the difficult movements naturally easy. - I’m very comfortable putting an amateur on this horse, he has a mind and character which is not only a joy to work with but you feel absolutely safe on him no matter what. This horse is the ideal temperature that we all are searching for in a horse, the perfect amount of go while still being extremely respectful of the half halt. Like butter in your hands. - To top it off his good solid bloodlines give him every advantage to succeed to the very top! It’s becoming more obvious that the half steps are going to develop very easily and problem free. This lovely horse who is a puppy to handle is going to be the apple of your eye and give you the world. 125k or nearest offer .He’s absolutely on target for PSG early this year and its only the beginning, the sky's the limit for you both!